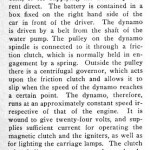 In our post on the Pipe car recently, we made note of the Jenatzy electric clutch being used on the car. Fortunately, full details of this unique coupling device were found and we can all now marvel at the details of this unit that was made over 100 years ago. 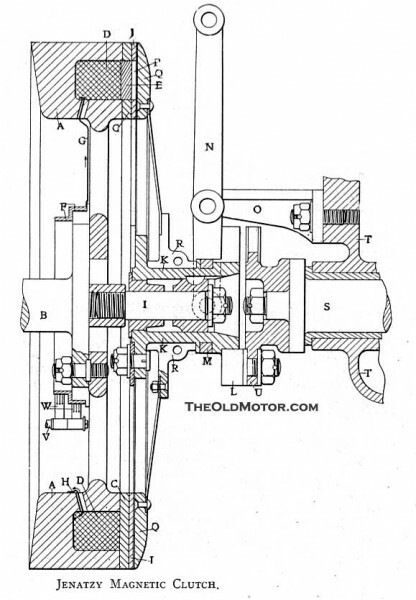 The complicated result yielded the following benefits; any desired degree of clutch slip was possible, the car could get underway gradually without any clutch grabbing, very little effort was needed to operate the pedal, and finally shifting was easier and quicker because of the very small amount of rotating weight of the lightweight clutch plate assembly. All of these benefits were welcome in a time when many clutches where quite primitive and difficult to operate. If you are of a technical bent, read the amazing details just above where you can also learn about the early battery and dynamo system that operated the igniters and carriage lamps. In reading it, we did notice one detail that was omitted; what to do if the system failed. Unless we are missing something, the downside was that it appears the clutch could not stay engaged, rendering the car unusable until the system was repaired. Camille Jenatzy (the Red Devil) was often referred to as M. Jenatzy, as he is in the article covering the clutch. The Horseless Age, June 22, 1904, article covering the Gordon Bennett Race in Germany, informs you of what a race was like back in the Mercedes driver’s time in the racing game. You can also view our earlier article on the Pipe that utilized this clutch. 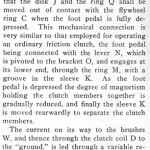 This entry was posted in Technical Features and tagged Mercedes, Pipe car, The 1903 Jenatzy Magnetic Clutch. Just a minor thing: the “M” before the name usually indicates Monsieur. Common usage in Europe. The first auto to attain 100 km per hour was Janetzy’s bullet-shape electric “La jamais contente” (“the never content”), April 29, 1899. Sadly, he died after a hunting accident on December 8, 1913. Reports say he hid behind some brush, making “animal noises” as a joke. His hunting friends didn’t know it was a joke, and fired. He was rushed to hospital in a friend’s Mercedes, which fulfilled his own prophecy of “dying in a Mercedes”. Yes, That is what we forgot to ad to the post the explanation about the M. He was a very talented individual and it is sad he went the way he did. Is the Jenatzy Magnetic Clutch the earliest electrically actuated launch control? If that is the case he was 70 years ahead of all the drag racers. 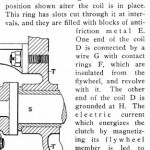 I do not know if they are related, or even similar, but the Entz magnetic clutch was developed around 1898. Hiram Percy Maxim tried it out on an early Columbia and nearly burned the car up with an electrical fire… but it was built and tested. These were attempts to avoid shifting gears, something many early auto makers thought was beyond the capacity of the average person (Ford thought so, hence his determination to keep the Motel T transmission). When it became apparent thais was not the case, the complicated and expensive electric devices had no market. I think the Entz transmission (or its lineal descendent) is used today in diesel-electric locomotives. to manual shift in case of a malfunction.